Well, It's time for 2014 to go. This last date uses to be a good one to look back and see the big picture.Having started my SOTA activity on the late 2013, 2014 has been the first full year I've dedicated to this hobby (hobbies must be said, as radio and hiking came together). Also I've able to apply for my first 100 activator points award, and the Platinum Mountaint Explorer certificate, with all the QSOs made on my side from summits. 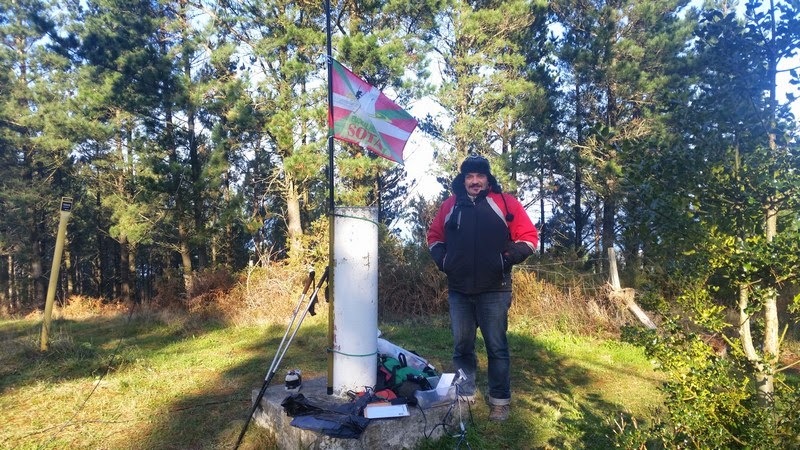 We have started too the new Euskal Herriko Mendiak (Mountains of the Basque Countries) award which is being well received by the SOTA participants. A lot of work was needed to make the rules, design the certificates, translate all the documentation and start the web site, but at last, all is now running well. 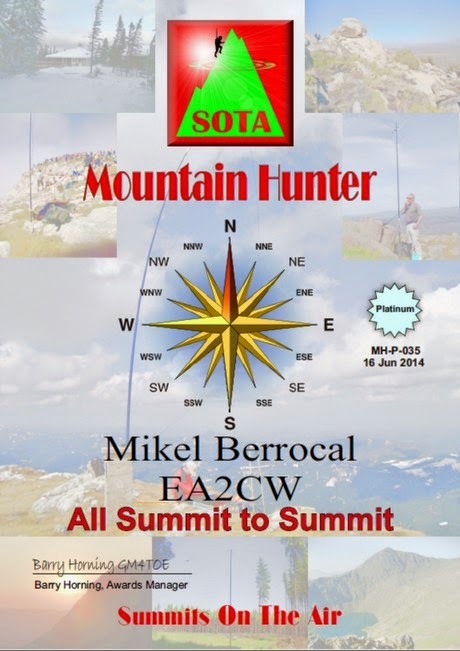 The EA2 SOTA Eguna (EA2 SOTA day) celebrated on june with a amazing involvement of the activators and chasers of the zone, the new mail list, and the creation of a small (by the moment) whatsapp SOTA activators group have tied stronger relationships amongst the SOTA partners of our Association. Nowadays combined activations by some of the most active activators in EA2 have become usual. Not a bad year at all. On the years ahead, a lot of challenges waiting,the most serious, the Mountain Goat! Good to see than despite the goals achieved, there is a long way to walk. 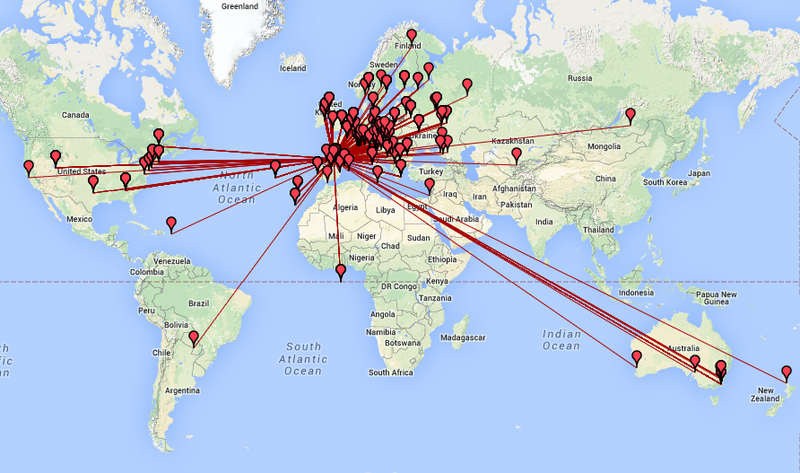 Thanks to all the people who has made all this possible: The SOTA MT, EA2 AMs, activators and chasers around the world, people from EA2 who has contributed to disclose, encourage and expand SOTA, and much more people. 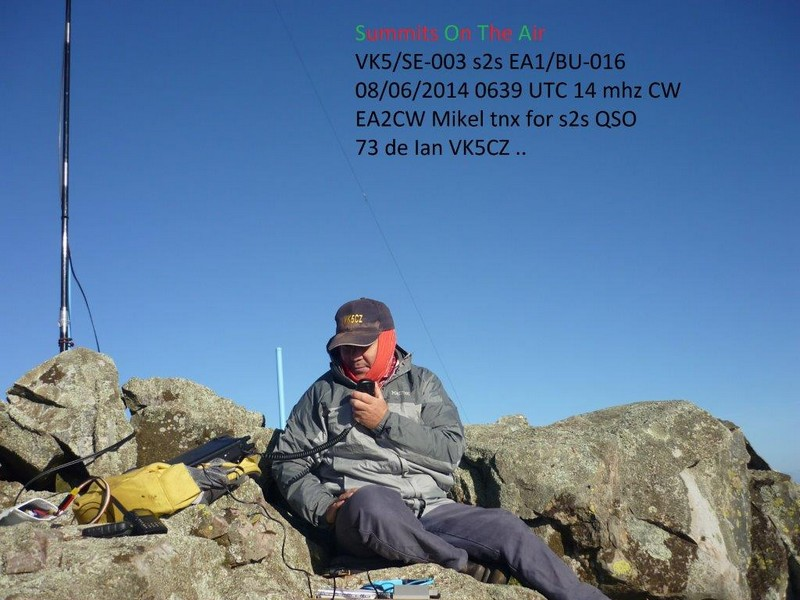 Special mention to Marcial EA2BDS who, apart from his hard work on the "Euskal Herriko Mendiak Award" development, has made possible to me to make a lot of activations. Just a big thank you! 73 and go ahead! Happy new 2015!